Last evening, I ran off The Prince and the Showgirl for the umpteenth time. It's the story of Charles, Prince Regent of Carpathia (Laurence Olivier) and Elsie Marina, the plucky American stage girl (Marilyn Monroe), thrown together in London during the 1911 coronation of George V. If you haven't seen this movie before, I would recommend it. Olivier is screamingly funny doing his Balkan Royalty shtick, as is Sybil Thorndike as the Queen Dowager, and many of their lines ("So amusink how you vil laugh" and "I desire a glass of dat Champagne I see over there") have entered into the family lexicon. 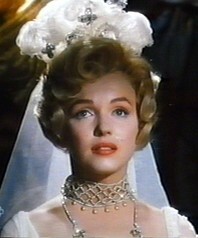 But what continues to mystify me every time I watch this movie is the attraction of Marilyn Monroe. I. Just. Don't. Get. It. I try to be objective. I try to think what kind of impact her brand of sultriness had on the Hollywood of the 50's. I try to figure what made her stand out to such an extent that not only was she pursued by legions of drooling fans in her own day, but she still has a fiercely loyal following now. But I can't. I just can't. To me, she's simply a rayther vulgar bimbo. Elsie Marina has her Soul's Awakening in Westminster Abbey. Yeah, right. My favorite line of Monroe's in the movie is when, in defiance to the anti-American comments the Prince is making to a friend over the telephone, Elsie lifts her glass of champagne and mouths, "God bless President Taft!" (Only it comes out "Puhresd'nt Taft".) I always laugh heartily at this, even though I don't believe that was the intention of the line. Incidentally, Olivier records in his autobiography that he was quite prepared to fall in love with Monroe when they began this project. This feeling apparently lasted all of about ten minutes after he started working with her. The ego, the tantrums, the lack of professionalism, the two-bit "method" acting induced in him a violent urge to strangle her. Perspective, Robbo. It's all perspective. 1) At the time, a blonde bimbo bursting out her gown on screen was a true novelty. It was downright groundbreaking. Today, we're so bombarded by them in the 24/7 media I daresay we suffer from "bimbo fatigue". 2) "The Prince and the Showgirl" was a vanity project by Monroe's own production company (its first and only venture) as a way for her to show what a "serious actress" she was. Fact is, she wasn't. But if you watch Billy Wilder's "Some Like It Hot" you'd be hard pressed to think of another actress who would work better with Tony Curtis and Jack Lemmon. A classic, I tell ya. Look at it this way, years from now one of your grandson's will probably take the helm here and post something similar about Paris Hilton (though I'm already asking the question "why?"). Personally, I like Marilyn Monroe because, by today's standards, she was a "curvy" woman. Her acting? Not so great. "On the fifty-third take," Wilder later recalled, "I told her we had put the line on pieces of paper and they were in every drawer she would open... She went to the wrong piece of furniture."